To complete this listing, please continue to confirm your identity with a bank account. 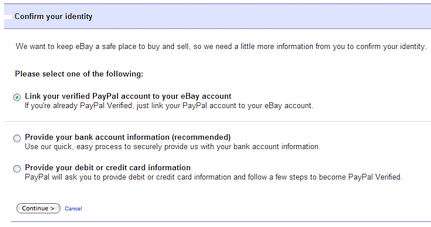 We want to keep eBay a safe place to buy and sell, so we need a little more information from you to confirm your identity. 項目-What do you want to sell today? * To complete this listing, please continue to confirm your identity with a bank account. Sorry! We’re currently experiencing technical difficulties and are unable to complete the process at this time. > Sorry! We’re currently experiencing technical difficulties and are unable to complete the process at this time.